On March 15th, Rousseau would’ve said the Dutch experienced ‘true freedom’ as they went to the polling stations to cast their vote and elect a new parliament. This particular election generated a lot of foreign interest, after the Brexit-referendum and US presidential election were surprisingly decided in favor of populist rhetoric centered around fear-mongering and xenophobia. When the Dutch polls closed, and Ipsos posted its exit-poll (generated by asking voters outside selected polling stations what they had just voted), it became clear the ‘populist uprising’ had come to a halt. Around the world, a sigh of relief could be heard if one listened carefully, as reporters packed up their bags to go back home as the prospected drama of a populist takeover of Dutch government came to a screeching halt. However, the prospected outcome does spell difficulties ahead. What does the election result actually mean for The Netherlands? My personal biases: I voted D66; I’m pro EU, pro Environment, pro social and fiscal equality. Dutch parliament has never been like the most well-known examples of democracy, such as the American and British systems. We rely on a system of coalitions between parties in which those parties have to work together in order to create legislature. Sometimes, this means the bigger party gets more of a say in what legislation is pushed through and what isn’t, to the detriment of the smaller party. This is the main cause of the PvdA (social democrats, literally: Party of the Labour) losing over 75% of their total number of seats after creating a coalition in 2012 with the VVD (Liberals). The same happened in 2012 with the CDA (Christian democrats) after aligning themselves with (again) the VVD. This year, the Dutch were more divided than previous elections. This means that no three parties can create a majority coalition of 76 seats in parliament (Tweede Kamer). This kind of election result hasn’t happened since 1973, as three medium-sized religious parties soon merged into one to form the CDA. It is a result of contradictions. People say Rutte won, which is true as his party remains the largest party in The Netherlands, it is also false as he lost eight seats. People say Wilders lost, yet his party gained five seats. People say ‘the Left’ has lost as our traditional social democratic party lost 29 seats, yet other left-wing parties recorded record victories, so much so that traditionally right-wing parties combined showed a net loss of seats. This election result has multiple winners, and multiple losers – yet it is not often clear who the winners and who the losers are. This is further complicated by the fact that our political parties are not strictly tied to ideologies: you can be fiscally conservative and socially progressive at the same time. Hell, we even have an elected Muslim-party now (DENK). It is not easy to know, especially for an outsider, what this election result means. This article will take six hotly debated talking points, and see which side of that particular debate actually won, as to create more clarity in which direction The Netherlands is headed. In the Netherlands, we have a few anti-EU parties, most notably Geert Wilders’ PVV which wants a ‘Nexit’ as per example of the British Brexit. They are joined on the right-wing by Forum voor Democratie (FvD), who want to seriously re-evaluate our position in the EU. Furthermore, the Socialist Party (SP) sees the EU as a threat to our low-schooled workers. Lastly, DENK (a Turkish party) is ideologically opposed to the EU as that would be Erdogan’s instruction. On the other hand, all other parties are either okay with the EU, or want to deepen relations. This gives us the following table. This shows us that yes, anti-EU sentiment is on the rise, but it is not a real threat to our relationship with the EU – and the likelihood that it would’ve been was incredibly small. The fact that the anti-EU sentiment is on the rise can easily be explained by the sudden influx of refugees, something which the EU as a whole was unprepared for to handle effectively. This generated a lot of resentment, especially in 2015 at the height of the refugee-crisis. We, the Dutch, are still in favor of the EU. Although we might want some reforms within the EU itself, we are not going to leave just yet. The Dutch have always (in recent memory, at least) been on the forefront of social liberalism, or progressiveness – basically, the freedom of the individual to do or be whatever he or she chooses. Social liberalism is opposed by social conservatives, often out of religious views, but also from their conservative outlook on life. Parties which promote more social liberties are D66, GroenLinks, SP, PvdA, PvdD and FvD, while the others either do not, or actively work to impair the freedoms received. This means that the VVD, which is a conservative party, is classified as not being socially liberal even though they are not doing anything against things like gay marriage. The resulting table shows us that the progressive parties as a whole have lost eight seats in total, though most can be ascribed to the PvdA‘s loss. Social liberal values were not a top tier talking point such as our role within the EU, so this does not necessarily mean that our country as a whole has become less accepting of those less fortunate or different from themselves, it could also mean that people did not vote based on this issue. Our previous government consisted of two parties, the PvdA and VVD. The one was a social democrat party, while the other was fiscal conservative. I already talked about how the PvdA, the social democrat party, recorded an enormous loss in seats. 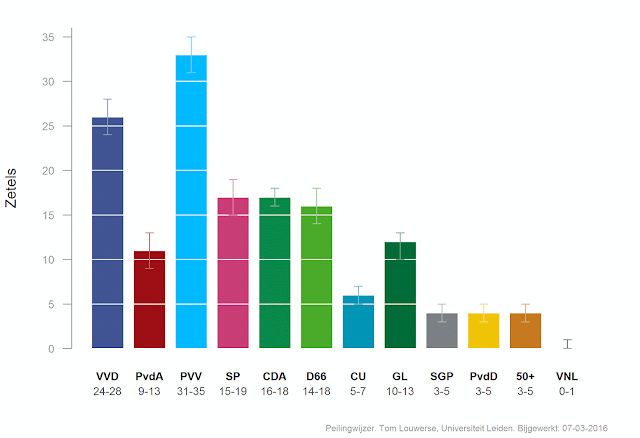 However, does this mean that economic liberals (VVD, CDA, D66, 50Plus, SGP and FvD) gained ground this election? Again, the table shows not a large shift – but large enough to shift the balance from a once more economic equality-focussed parliament, to a parliament that pushes for more fiscal liberties. The largest gains by economically liberal parties are held by D66 (+7) and CDA (+6), yet the biggest winner is on the other side (GroenLinks, +10) but again, PvdA is the biggest loser, off-setting GroenLinks‘ victory. Again, this was not such a big talking point during the election, but the next one is. For years, we’ve heard that ‘populism is on the rise’. We know the example of Geert Wilders, our very own right-wing extremist next to Le Pen, Trump and Farage. We do, historically, have another populist party on the other side of the traditional left/right-divide: the SP (Socialist Party). While often overlooked, left-wing populism is a thing too. One might also argue that, under Jesse Klaver’s leadership, GroenLinks also became a source of left-wing populism as his party embraced American-style campaigning reminiscent of Obama and Sanders, yet for convenience sake I will not count them as one – yet. These two are now joined by Forum voor Democratie and DENK, the latter being a populist party aimed not at the general population, but mainly those of Turkish heritage. The table shows us that yes, populism is on the rise – but it is still not a large shift some would have expected. The PVV is the main cause of the rise, winning five seats. Their victory, however, is marginalized when you reflect upon their position in the polls exactly one year ago, when they sat atop the chart at around 33 seats in parliament. Taking this into account, it becomes more clear why people would say “populism lost” after Wilders ‘only’ gained five seats and populists gained a total of nine seats. They won, yet still lost. Some would say that, when confronted with a perceived threat by another religion, a religious person strengthens their beliefs. It would be like me saying something you own but did not especially care for is stupid, and you suddenly feel the urge to defend said product. At its core, Christianity vs. Islam rests on the same basis as for instance the PS4 vs. Xbox divide. Now that DENK openly conveys a Islamic affinity, this might cause people to reaffirm their Christian heritage by voting on a Christian party, of which we have three: CDA, ChristenUnie, and SGP. Again, a small rise. Three of the acquired seats are accounted for by DENK, and all six other are won by the CDA. This means exactly nothing: previous elections (2012) showed a historic loss for CDA after their failed coalition with VVD. The +6 seats is just them bouncing back to normal levels. The other Christian parties had no win or loss to their seat totals. Some would say the fact that DENK got three seats means there is a ‘fifth column’ made up of muslims. I reckon these are just former PvdA voters who got handed an option which they liked better, and this result means that the PvdA lost support of most Turks. One of the hottest topics in debates, next to our role in the European Union, was our dedication to the environment. Nobody wants to actively act against the environment in The Netherlands, yet there are those parties which want to go the extra mile. Parties such as Groenlinks (translation: GreenLeft), D66, ChristenUnie, and PvdD (literal translation: Party for the Animals). Especially the way ChristenUnie (lit: Christian Union) talked about the environment (“we have to take good care of the creation”) was adorable. And here we finally see a large shift, with the notorious green parties winning twenty seats. 50% of that is accounted for by GroenLinks, which grew by 250%. PvdD grew by 150%, and D66 grew by nearly 60%. The Netherlands will, hopefully, become a lot more green and it is long overdue as we are behind on every agreement on the environment we’ve signed. Rutte will most likely extend his period as our prime minister as his party gets to go ahead and try to form a coalition first. The most likely coalition he will form is ‘GreenRight’, a coalition between his party VVD, the Christian democrats at CDA, the greens of GroenLinks, and the liberals at D66. Before Rutte became head of the VVD, he saw his party’s future as being more environment orientated which was quickly shot down by party officials. His plans might get revitalized with this new coalition, which has the christian morality of the CDA, the environmental awareness and social liberalism of GroenLinks and D66, and the economically liberal attitude of CDA, VVD and D66, all soaked in a pro-EU sauce. If it will last depends on Rutte’s willingness to bend to the environmental requests of GroenLinks, who want those that negatively affect the environment require to pay for it in the form of taxes; taxes on meat, car usage, polluting companies, etc. Klaver stated multiple times that this is a breaking point for him, and if Rutte is willing to grant him those issues, I think The Netherlands will be able to prosper under this coalition. If not, we might have elections again next year. If you’d like to support me writing this blog, why not share it, or like my page on facebook or follow me on twitter, or consider whitelisting me from your adblock!